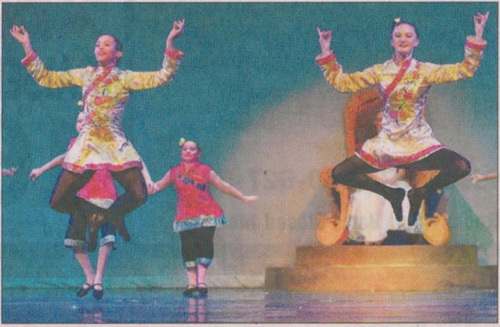 Above, Connecticut Concert Ballet dancers Emma Triantafyllou of Hebron, left, Tricia Kearney of Manchester, center, and Vanessa Polidoro of Tolland rehearse the Chinese Dance for “The Nutcracker,” to be staged at Manchester High School in four shows Saturday and Sunday. The Manchester Symphony Orchestra will join the ballet for two shows on Saturday. MANCHESTER — The Connecticut Concert Ballet will collaborate with the Manchester Symphony Orchestra for two shows of the Christmas classic “The Nutcracker” on Saturday, Dec. 9. The orchestra will perform live music for the shows on Saturday at noon and 4 p.m. The ballet company will give additional performances on Sunday, Dec. 10, at noon and 4 p.m. in Bailey Auditorium at Manchester High School, 134 Middle Turnpike East. Ballet artistic directors are David Lawrence and Wendy Fish-Lawrence. Approximately 130 local dancers will have roles in the ballet. Windsor: Sage Hanlon, Russ­ian Soloist, Spanish Soloist. Professional guest artists will be David DuBois as the Nutcracker and Kristy DuBois as the Sugar Plum Fairy. Advance tickets are preferred front and center seats, $35; gen­eral admission, adults, $25, chil­dren, students, and seniors, $15. Tickets are $3 more if purchased at the door: $38, $28, $18. 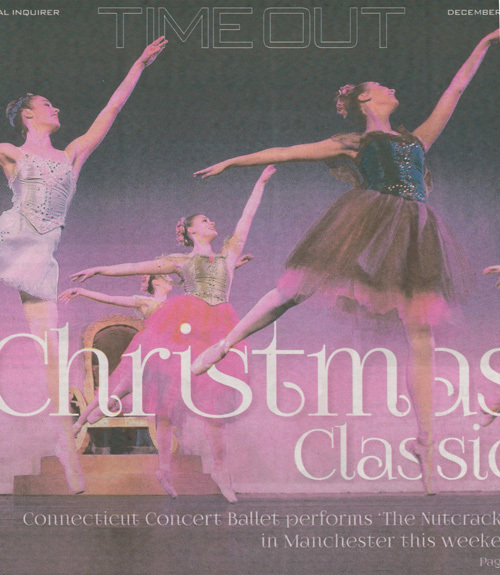 Connecticut Concert Ballet’s “The Nutcracker” has been a holiday event for more than 40 years. Traditions include a giant Christmas tree that grows before your eyes, toy soldiers, twirling snowflakes, waltzing flowers, and visions of sug­arplums. Connecticut Concert Ballet is a semi-professional classical ballet school and performing arts organization with studios in Manchester at 280 Garden Grove Road and in Windsor in the Great Hall at Grace Church, 311 Broad St. Proceeds from the show will be used to fund the nonprofit school.